The applet presents a tool for investigating an infamous problem. It showed up in 1980 as a practice problem on the Preliminary Scholastic Aptitude Exam, but, to an embarrassment of the Educational Testing Service, the marked answer was incorrect. The expected solution was this. A square pyramid has 5 faces and a tetrahedron 4 faces. When two triangular faces are eliminated by gluing them together there remain 5 + 4 - 2 = 7 faces. By adding a second square-base pyramid, it becomes absolutely clear that, in the problem, there are two pairs of adjacent faces that align on a single plane (i.e., are coplanar) so that the resulting solid has two faces less than expected: 5 in all. 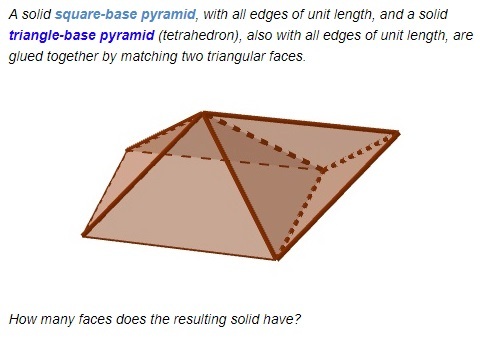 (As an aside, what is the relationship between the volumes of the square pyramid and the tertrahedron? Find out.